Fashionable dogmas tells us that classical music should do and not be. However, Jonathan Harvey differentiated between linear music that is composed "against what has been established as a pattern" and transcendental global music that sees "everything as a unity". This split between linear and global can be interpreted as corresponding to the music of doing and the music of being. Paul Brunton's non-aligned beliefs were rooted in Vedanta. 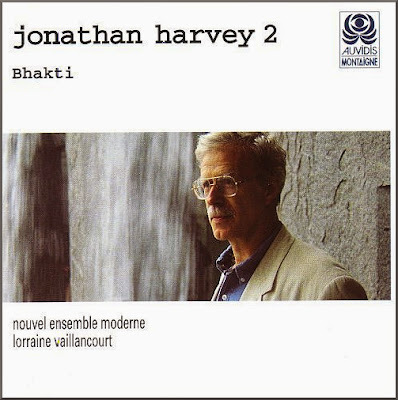 Bhakti is a Hindu term signifying devotion as a path to salvation and Jonathan Harvey's eponymous work for chamber orchestra and quadraphonic tape has a quotation from the Rig Veda at the start of each of its twelve movements. Bhakti is quintessential music of being which proves fashionable dogmas wrong and makes the world seem a little less bewildering and confusing. Also on Facebook and Twitter. My copy of Bhakti was given to me by Jonathan Harvey. Any copyrighted material is included as "fair use", for the purpose of critical analysis only, and will be removed at the request of copyright owner(s).